Mark King ended a 25-year wait for a career title and dedicated it to his family for putting up with his gambling over the years. King turned professional in 1991 and has earned over £1million during that time, but admitted arriving in Northern Ireland for the Alex Higgins Trophy "without a tenner in the bank". 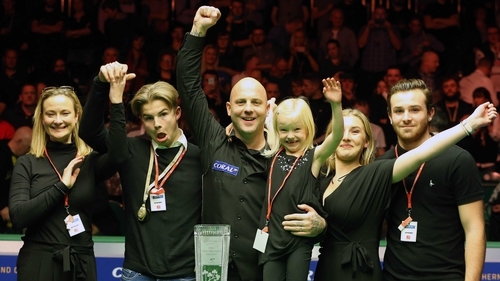 He borrowed money from his dad, Bill, to get to Belfast and was unable to hold back the tears as he addressed the crowd following a 9-8 final win over Barry Hawkins which earned him £70,000. "My dad and my mate lent me some money until my money comes through from (recent tournaments in) China"
King's wife, Sally, and three children watched on as King broke down, admitting he had treated his partner like "absolute c**p" during his battle with gambling. "To see that last two minutes, where (the children) came out... I have been dreaming of that ever since they were born. I never thought it would happen. Forty-two years old, I'm on the last nine of my career," he said. King also paid tribute to his dad, who has looked over his career from the off. He was unable to make the final owing to illness, but King admitted it was his financial help that got him there. "I want to thank my dad, I'm gutted he can't be here tonight, but he's not feeling well," he said, tearfully. "He's spent his last money on me, he lent me money to come here because I was skint. "I'm serious. He's 83 years old, he's a little ducker and diver, wheeling and dealing, and everyone on the tour knows him and I cannot thank him enough and the only thing I can do is to take that trophy home. "I came here without a tenner in the bank. My dad and my mate lent me some money until my money comes through from (recent tournaments in) China. "I go to Gamblers Anonymous once a week, it keeps me clean and I want to build now."